These days, everything comes with a warning. If you carefully read the tag on your couch, it is probably identified as a potential choking hazard. That sort of caution is a recent development; in previous centuries, risks of all kinds were pretty much ignored. There was some dim awareness in 17th-century London that it might not be a good idea to build houses out of wood and sticks and paper and then warm those houses with open flames — but they did it anyway. They also stored pitch, coal, alcohol and gunpowder in their makeshift homes. A further risk was the practice of building these tenements with jutting upper floors, so that the tops of the thatch-roofed buildings almost met over the narrow streets. In the early hours of Sunday, September 2, a fire broke out in a building on Pudding Lane that was a baker’s home and shop. It quickly spread through central parts of the city. There was no 9-1-1, of course, and even if there had been, it wouldn’t have done much good since there was no fire department. The law required every parish church to have ladders and buckets and firehooks, which were used to pull down buildings, and in one section of London there were even some primitive water pipes that were supposed to help in case of fire. By that Sunday night they had become useless, though — the pipes were fed by water wheels under London Bridge, and the water wheels had been incinerated. …We saw the fire as only one entire arch of fire from this to the other side of (London) bridge, and in a bow up the hill, for an arch of above a mile long. It made me weep to see it. The churches, houses, and all on fire and flaming at once, and a horrid noise the flames made, and the cracking of houses at their ruine. Over 13,000 houses and 87 churches were destroyed by the time the winds abated and the fire died on September 5. St. Paul’s cathedral was lost as well, partly due to bad luck: At the time the fire broke out, its exterior was covered with wooden scaffolding to facilitate some restoration work. The scaffolding caught fire, which ignited the roof beams, which caused the lead roof to melt. 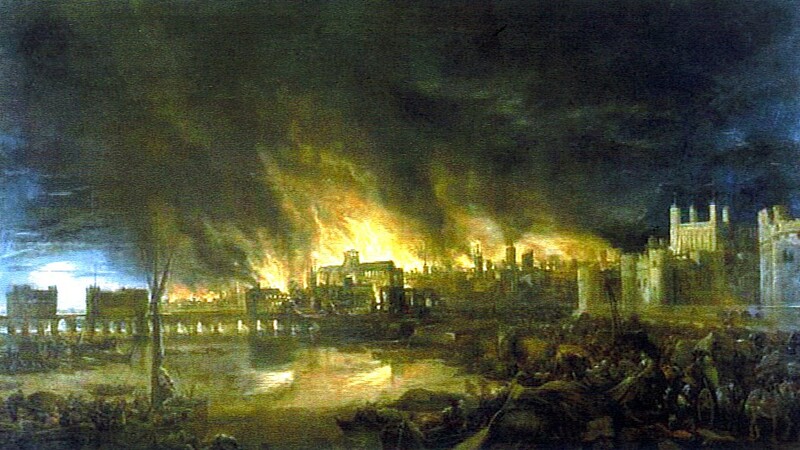 How many human lives were lost in the Great Fire of London is still a matter of dispute. Some contemporary reports mention as few as 6 or 8, but that low number is probably due to the fact that in those days, deaths of poor people and tradesmen were not recorded. It’s not unreasonable to assume that several hundred may have perished in the fire or the privation that followed. Soon after the disaster, a monument was erected that marks the location where the fire was finally snuffed out. Get this: You’ll recall that it started on Pudding Lane? Well, it stopped at Pye Corner. This entry was posted in History and tagged Great Fire of London. Bookmark the permalink. Old Ma O’Leary has nothing on Baker Pudding!